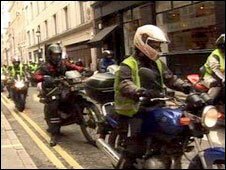 Hundreds of motorcyclists have driven slowly through central London in a demonstration over parking charges. The bikers are unhappy at a Westminster City Council trial scheme to charge riders £1.50 a day to park in bays. The motorcyclists met in Trafalgar Square and rode to Westminster City Hall in Victoria. The council said bikers should help pay for road maintenance but the group No to the Bike Parking Tax argued that many could not afford the fees. The parking charges scheme is currently on trial until the end of April and the council will decide then on whether to make it permanent. All the money collected from the charges will be reinvested to improve transport, the council has said. Councillor Danny Chalkley said: "As a council we do not shy away from robust debate and we of course support people's right to protest peacefully against policies they may not agree with. "But this demonstration is a complete over-reaction to what is still an experimental scheme." A similar protest by 500 bikers in December led to road closures and traffic problems in the area. In a letter to the council Warren Djanogly, chairman of the group No to the Bike Parking Tax, said: "It [the parking charges] forces hard-pressed citizens, used to parking for free as a reward for alleviating the problems of inner city congestion, to now pay a tax. Mr Djanogly added the tax would deter bikers from coming into the borough and the protesters wanted "to make their point heard". The introduction of the congestion charge in 2003 led to a rise in the amount of people using motorcycles and parking bays in parts of the borough were oversubscribed by 150%. The number of bays in streets and car parks has now been increased from 4,500 to more than 6,550.